The First Bleuette ..... on tiptoe ! the previous books which said quite other thing were "youthful indiscretions".
" Bleuette is a Jumeau, size 2 ". 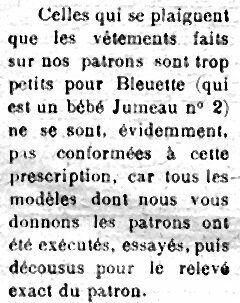 "... Those who complain that clothes made on our patterns are too small for Bleuette ( who is a doll Jumeau Number 2 ) are obviously not shaped to this prescription of the seam not includes..."
We can only take good note and it, definitively, of this information which raises totally the doubt persisting on the nature and the category of the first Bleuette whose dimension we knew (27 cms) the mould (Jumeau) but imperfectly the number of size. It is thus well Jumeau size number 2. What everybody knew but that nobody - to my knowledge - brought the proof of time of this. It is true that it is necessary to read La Semaine de Suzette to the magnifying glass! It does not make doubt that Madam Delaroche, manager placed well in the heart of the newspaper and by the way of her work knew what she wrote. She was in charge in particular the realization of the patterns and had thus certainly one or two Bleuette at hand to realize them. I notice that after this very net precision three times in three different newspapers and over two years are not any more. Is it what there what announces the arrival exactly 6/0 to relieve ? It is possible. What to conclude from it ? Nothing because that in April (see above), she speaks again about Bleuette Poupée Jumeau. The S.F.B.J. was born in 1899 and lived during its first six years of manufacturing by using the moulds of his founders in particular, those numerous, the House Jumeau This thus, until 1905 when the first engraved heads S.F.B.J. made their appearance duly engraved "S.F.B.J" . Well. The Semaine de Suzette, it, in the very first number of which is dated February 2nd, 1905, was naturally in gestation for at least one year. The publishing of this newspaper was a formidable, expensive bet because in colors, weekly, thus of one regularity frequents. It was necessary to reflect to it and very well to examine, before the edition, all the aspects of a such project in particular, indeed to study that of the small doll, given in addition to assure the launch of the newspaper, carrier of this one and hope of the editor. 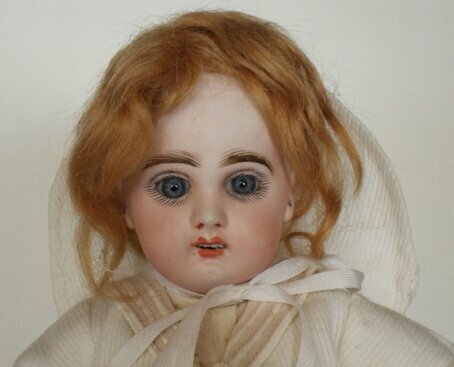 Numerous contacts were taken thus certainly with manufacturers of dolls and naturally, Mister Fleischman P.D.G. of the S.F.B.J., Market studies, calculated evaluations, choices of mould were thus made well before on 1905. 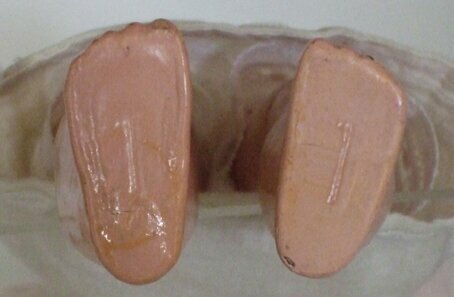 No doubt that these two Sirs, Henri Gautier and Salomon Fleischman came to an agreement on a small Jumeau mould, the size 2 in this particular case. It is obvious. In the time, we knew in France, in the general public susceptible to be interested, only dolls Jumeau; and the S.F.B.J. found there an important market for its small dolls intended for girls, future small sewing kits .
" The naming Jumeau was completely regular. The fact of placing this order at the S.F.B.J. 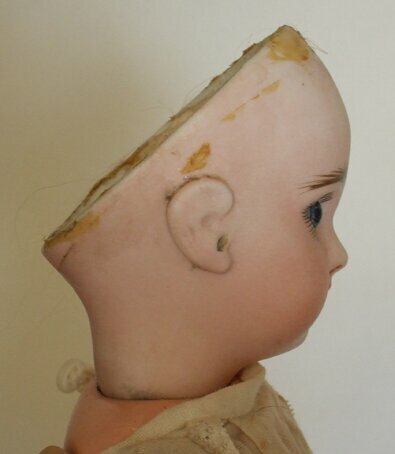 thus allowed Mister Gautier to call it " doll Jumeau " or " Manufacturing Jumeau ". It was a title which Émile Jumeau liked chiefly. He had clearly expressed it during the modification of the acts of society in 1895 : his partner, Douillet had obtained the faculty to stop the Society before time but by keeping the name Jumeau to the House. " ( Madam Anne-Marie Porot ). What looks like first Bleuette, such as we always admitted it. 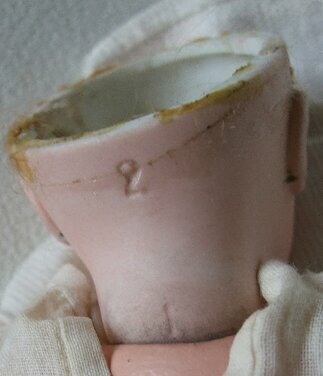 Marked 2 in the nape of the neck hollow or relief, or another, 2 in the top of the skullcap, 1 in the nape of the neck. This one is certainly the very first and we find it hardly. In here is one among which the numerous photos which illustrate this site shall say to you everything! Especially do not hesitate to write me to announce your opinion if you find it relevant or if you hold other proofs that those evoked above.